And today, that's the thing today when we see people, and people are so subject in this day to jumping at little flowery thing, till it makes you kind of wonder sometimes. Don't never think above—one man above another. No, sir, no matter who he is, if he's just a little old fellow out here giving tracts out on the street, and if he's a—a Billy Graham. 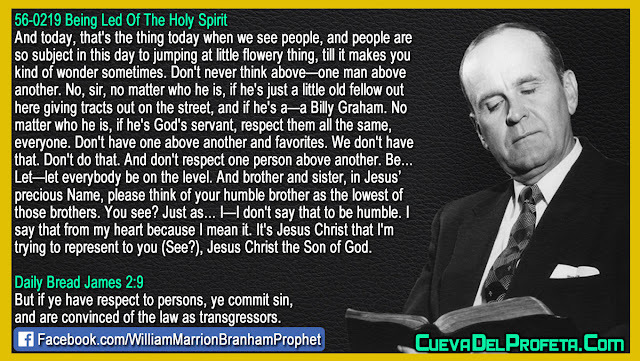 No matter who he is, if he's God's servant, respect them all the same, everyone. Don't have one above another and favorites. We don't have that. Don't do that. And don't respect one person above another. Be… Let—let everybody be on the level. And brother and sister, in Jesus’ precious Name, please think of your humble brother as the lowest of those brothers. You see? Just as… I—I don't say that to be humble. I say that from my heart because I mean it. It's Jesus Christ that I'm trying to represent to you (See? ), Jesus Christ the Son of God.